The exhibition “The Whole Truth: everything you always wanted to know about Jews” didn’t have much for Israeli art, but it did have an Israeli as art. 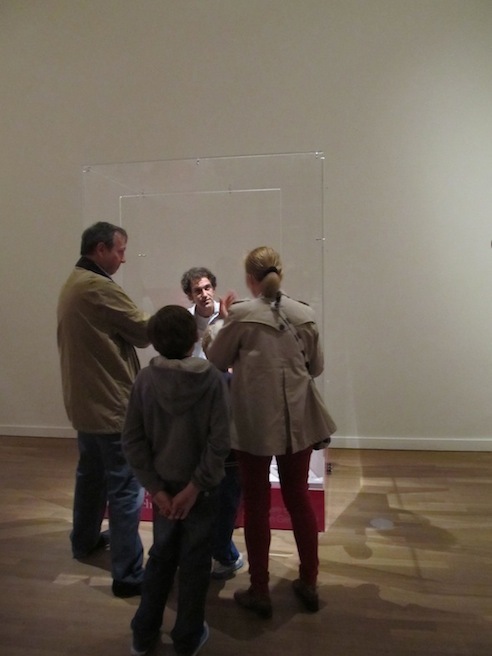 Or at least, sitting in a vitrine, picture-ready. Really? Well, yes: this provocative move got them into every newspaper here and evoked clashes with Rabbis around the world. 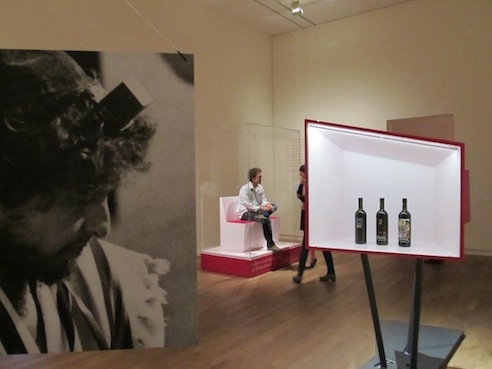 But the exhibition is disturbing not because of its so-called daring questions, such as “What do Jews do on Christmas?” “How to talk about Israel in the press” or “Are the Jews the chosen people?” but rather because through these questions, it attempts to pin down what exactly a Jew is, once and for all. The exhibition is actually not an art exhibition: it shows objects from everyday life, historical objects, quotes from contemporary and past sources, documentation and fictional videos. They are all arranged around questions, which supposedly all Germans have, but lack the Jews to ask (or the political correctness to ask them right). Choosing questions may be a sophisticated way to tackle the large, complicated task the curators took on, because it knowingly addresses people’s shame in their own ignorance. The problem begins with the answers: the exhibition almost completely avoids giving real ones, or taking on a voice of its own, opting instead for quoting politicians, rabbis, pop culture and academics, interchangeably and confusingly. For example, the answer to the question “How can you recognize a Jew?” is an installation of a beautiful historical survey of headdresses alongside modern-day hats for men and women of different Jewish religious communities. But among these religious signals, the exhibition includes secular symbols as well, such as military caps with Hebrew writing, summer straw hats and “tembel” hats associated with the Israeli pioneers. The message is double, implying that Jews can be identified by their headdresses not only if they are religious (in which case the headdress does have a complex, identifying role), but even if they are secular, their hats merely everyday accessories. The confusion between religious and national marks is understandable, but the exhibition should explain the signification, not jumble the signs. 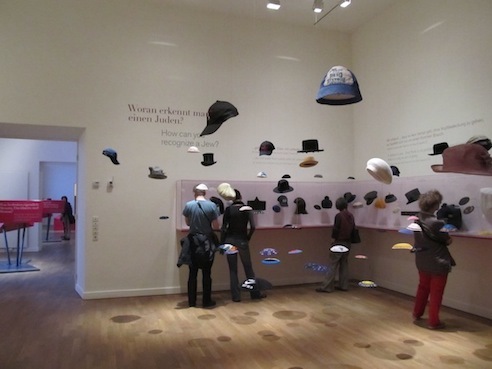 The installation has its humor, because the variety of hats expresses that Jews also come in many colors. However, catching this insinuation depends on insider’s knowledge, one that is not available to every viewer. In the end, no clear indication is given that Jews cannot, in fact, be identified by what is on their heads; nor for that matter that any religion or ethnicity cannot be seen, if a member of it chooses not to wear its outer signs. 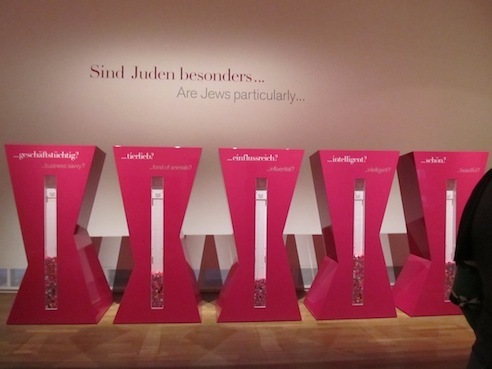 Within the Jewish museum, the relation to live Jewish culture is urgent, since the rest of the museum – and supposedly most of its German visitors – is largely unaware of Jewish history after the holocaust. On the other hand, taking on a project of this sort questions the very logic of the Jewish museum: how can it memorialize the loss of the Jews while celebrating their lively current culture? Caught in this clash, the exhibition strangely shows documentation and exhibition of contemporary (though faraway) culture and people. The most extreme case of this is the Jew in the box, as the answer to the question “are there any Jews left in Germany?”. On the day I visited, he was not technically a German Jew, but an Israeli named Guy, who’s been living in Berlin for the past seven years. The visitors were looking at him shyly, and indeed the situation was awkward. If there was an Asian man in a box, or a Turkish woman, would I dare to ask him or her the first clueless, possibly racist question that came to my mind? Probably not. I would also not assume that this individual could stand in for, and explain, a whole community or race. I decided not to ask Guy this question, since it was his first day on the job, and since he was already putting himself out there enough. I did ask him why he wanted to be part of the installation, to which he said that these questions should rather be asked, and that most Germans really don’t have any contact to Jews, so he is not ashamed to answer. The underlying problem of the installation, and by definition of the whole show, is that it refuses a complex understanding of Jewish identity today. It shows the daily Jew as an interchangeable identity, and in general comes dangerously close to portraying Jews as ethnological subjects – mysterious, attractive maybe – but nonetheless defined as such, rather than Judaism as one aspect in a layered, contemporary identity. All content and pictures by Adela Yawitz. Read all of Adela’s posts here.